New York Water Taxi (NYWT) has been selected as one of the preferred transportation partners of the National September 11 Memorial & Museum. As an add on to existing Hop-on/Hop-off service, New York Water Taxi will offer a free timed visitor pass to the National September 11 Memorial from Pier 84 at West 44th St. (and the Hudson River) to Battery Park, Slip 6, a short walk to the Memorial site. Tickets aboard the Hop-on/Hop-off service, including a free timed visitor pass to the Memorial, are $27.50 for adults and $17.50 for children 3-12, which includes a $2.50 processing fee. ServIce To the Memorial will begin on September 12, 2011 and will run year round. New York Water Taxi is proud to be able to provide servIce To New Yorkers and visitors who wish to pay tribute to the nearly 3,000 people killed in the 2001 terror attacks and to showcase the resilience, beauty and strength of the city, post-9/11 from a waterfront perspective. 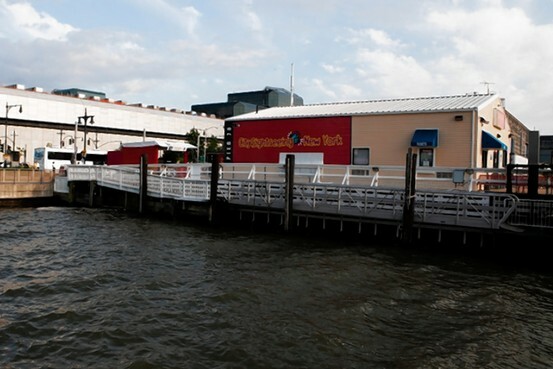 Passengers are welcome to hop aboard the Water Taxi before and after visiting the Memorial to enjoy spectacular views of the skyline, waterfront neighborhoods, parks and attractions, restaurants and cultural institutions. In addition to West 44th Street and the Battery, NYWT's Hop-on/Hop-off service stops at South Street Seaport (Pier 17) and Fulton Ferry Landing (DUMBO, Brooklyn), providing easy access to the Intrepid Sea, Air and Space Museum, to see the Statue of Liberty, Times Square, Broadway, the Financial District, the Brooklyn Bridge, Brooklyn Bridge Park, Governors Island, The National Museum of the American Indian, The Museum of Jewish Heritage, New York Crystal Palace, Hudson River Park and more. NYWT's goal, as it has been since 2002, is to utilize the city's waterways and harbors to reduce street traffic, and environmental pollution while connecting people to the fabric and history of the city. Once visitors recognize that there are easily accessible transportation alternatives to the Memorial, and to explore the city, NYWT hopes that they will leave their cars at home and lessen the impact on the environment, lower Manhattan neighborhoods and the city overall. For more information about New York Water Taxi and to purchase tickets please visit www.nywatertaxi.com. Enjoy the ride.